Wonderful park for horseback riding, hiking, walking, running, and biking enthusiasts. There are quiet picnic areas for small group activities and isolated alcoves for quiet contemplation. Near the entrance of the park are grassy and open areas to fly kites. Model glider airplane flying also take place at the center of the park with organized flying events and plenty of help from experts. 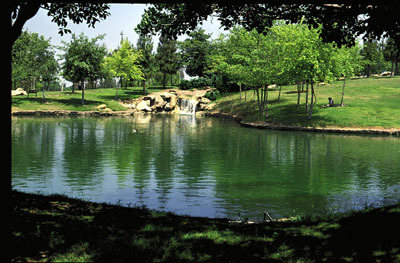 Beautiful park with it's showcase lake and waterfall. For the sports enthusiats, there are 12 tennis courts, baseball and volleyball courts.